Two astronauts completed upgrades to the ISS today in a picture perfect spacewalk. Barry Wilmore and Terry Virts journeyed outside the station once more to complete their third and final spacewalk. The upgrades to the station will allow new International Docking Adapters (IDAs) to be installed later this year. The IDAs will be completed later this year when two port adapters are shipped to the station via a SpaceX Dragon cargo craft. Once installed, the new IDAs will be complete and ready for testing and operations. Commercial space craft from SpaceX and Boeing are expected to dock with the ISS starting in 2017. Both SpaceX and Boeing are developing spacecraft to ferry astronauts to the ISS under contract with NASA. The current program, called Commercial Crew Transportation Capability (CCtCap), is designed to spur innovation in the creation of a new set of space launchers for NASA to use in getting crews to the ISS. With the addition of Orion, the U.S. will have three different crew vehicles to choose from. The astronauts breezed through their planned assignments by first installing booms with an antenna arrays. These are needed for communications between the ISS and the future spacecraft. The team also installed nearly 400 feet (122 meters) of cable. 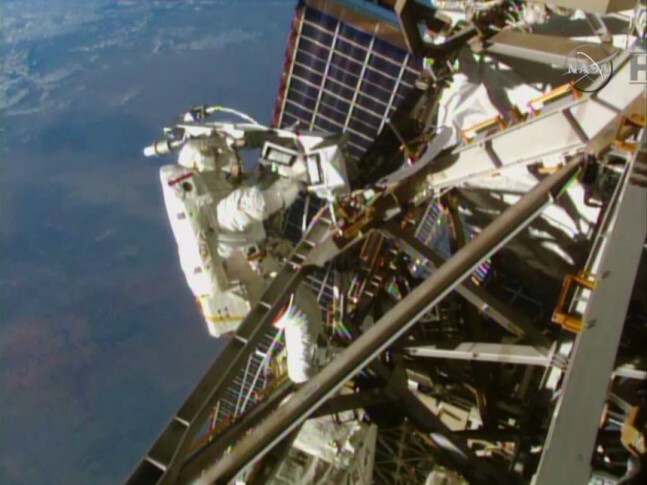 In total, the astronauts installed over 800 feet of cable and performed maintenance on various station parts including lubrication of the Canadarm 2. The spacewalk was made much easier after the astronauts were able to perform ‘get-ahead’ work on the prior two space walks. While the process of installing all these modifications appeared easy, the reality was very different. Both Wilmore and Virts practiced in NASA’s Neutral Buoyancy Lab (NBL) for months to hone their skills for the installation of these upgrades. During today’s spacewalk, there was only a minor amount of water accumulation in one of the spacesuits — the only difficulty on the swiftly completed spacewalk. On the last trip outside the ISS (EVA 186), Virts’ helmet had noticeable water globules present upon his return. NASA engineers are still working to determine the root cause of the issues. They have isolated the problem to the cooling system’s fan pump separator (possible water leakage in the bearing unit), but have not resolved the reason for the leak. Wilmore reported no issues with his suit during any of the three spacewalks. The space suit Virts wore has been known to have water leak issues. EVA 187, NASA’s official designation of the spacewalk, started at 7:10 a.m. EST (1210 GMT) and ended 5-hours and 38-minutes later. The entire spacewalk took one hour less than planned for. 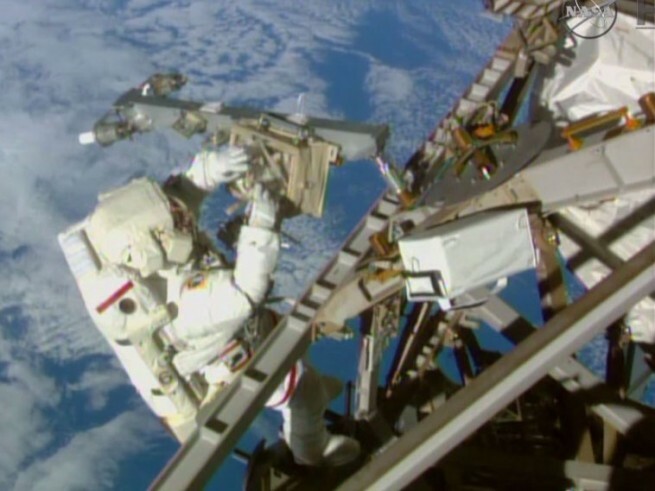 The series of spacewalks started on Feb. 21.